5 Reasons Your Business Needs A Better Alarm System | Calgary Alarm Inc.
Investment into theft and loss prevention is one that all business owners have to make. Protecting the goods, equipment and space that constitutes your livelihood is essential. And having technology in place, such as an alarm and other security measures, to make sure this happens is not only responsible, it carries with it some important financial and liability incentives. Here are 5 reasons your business needs a better alarm system. Insurance incentives. Most companies that provide insurance to businesses mandate that certain precautionary measures be put in place before they are willing to put money up to insure the loss or damage of goods that falls outside of a business owner’s control. Much of this coverage is still dependent on the nature of the business, the scope of the operations, location etc. But business owners often see material decreases in premiums when they do things like upgrade monitoring and alarm systems, or install more sophisticated and durable locks and forced entry prevention features. Loss prevention. Break-ins mean more than just loss of damaged goods. The opportunity cost of a break-in, that is, the amount of time you have to remain closed or working at less than full capacity while you repair, replace or generally return the premises to regular operating levels can mean lost business during this down time. Quicker response times by authorities. 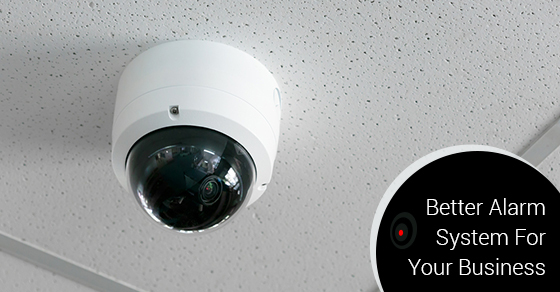 Integrated, wireless alarm systems that are connected not only to you, but to the service provider and the authorities 24/7 means that in the event of forced-entry or a smoke detector being activated, someone is there to act and respond in real time. This is especially useful if you are unable to be the first responder. Knowing that immediate action is being taken to mitigate damages or even thwart a disaster altogether is worth the investment. Around the clock support. Better, more comprehensive alarm systems usually come with the technical support and customer service to match the investment. Being able to speak to a trained professional whenever a problem arises, as well as having a team of people on hand to deal with things like false alarms takes much of the security grunt work off your hands, freeing your time up for things like running and building your business. Crime prevention. Having a sophisticated, comprehensive security system not only helps mitigate losses and damages in the event of a break-in, it often completely prevents them from happening in the first place. Just the presence of highly sensitive motion sensing cameras and alarm systems is enough to deter most would-be burglars from attempting a forced-entry. Keeping up to date with and upgrading your business’ alarm and security system is an investment in your livelihood and part of the cost of doing business. Think of it as the cost of preventing potentially greater, future costs. If you have not upgraded, or rethought your business’ alarm system in the last several years, the above 5 reasons to do so are just some of the ones you might consider.